Taste test: These are thin potato chips with a mild vinegar flavor. They're very tasty, and they were popular around the chip bowl. There were a ton of chips in this large 10-oz. bag. These could be your chip if you like a good mix of vinegar and potato flavor, but if you're looking for a serious bang of vinegar, there are many stronger chips out there. Smell test: Some good, mild vinegar zing. 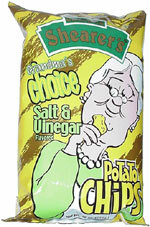 From the package: “Dear Grandma Shearer: Word of your fine Salt & Vinegar Chips has sailed across the seas. My mates back in Ohio say they're the finest grub they've ever sunk their boots into. Well, I'm in a real kettle of fish. I was hoping you could throw me a line. You see, here in England, the wife and I have a little fish n' chips shoppe. I don't know what's gotten into people, but lately, we're up to our gills in business. The problem is, we've got these shrimpy little kettles, and we can't fry up enough chips to keep up with the demand. I was hoping to bait you with an offer to expand your sales territory. This is bound to improve your net worth. I'm not trying to worm my way in on your business, but do you think you could send some of your fine chips our way? I'm sure they'd look mighty nice wrapped in yesterday's copy of the London Times! Sincerely, Salt T. Dawge."